Acknowledgments: Heartfelt thanks to kannaophelia for Beta reading. Magic happens. It happens everywhere and everyday. You just have to know where to look. Zatanna gazed intently at the source of some of the most powerful and yet most subtle magic that she knew. Dark, mysterious black magic from the tropics, created by the raw energy of the sunlight and the sparkling waters of the subtropical climate. In her hand she held a mug of the steaming brew. Some people cut its magic by introducing cow's milk or reducing its bitterness with sugar. But sugar could make one’s passions run out of control and she felt there was more than enough risk of that already. From her chair in the quietest part of the casino that she could find, Zatanna watched her as she approached. Everything about her exuded magic. Her skirt seemed to billow in wind that wasn't there. Her strapless top looked from a distance like an old fashioned bodice, tied at the front with a cord. The colours were dark reds and blues that showed up to advantage in dim light, and even better in the eerie light of a candle glow. She wore her reddish gold hair up, tied with a long, red ribbon, and a black choker. She affected the appearance of someone who had just stepped out of the nineteenth century. It was an unconventional look to be sure, but one Zatanna was not disposed to comment upon, given her own trademark black tuxedo and fishnet stockings. She could have worn regular clothes or even her superhero style costume but neither seemed to attract the right kind of woman theway the tuxedo did. Zatana reminded herself that this wasn’t a job interview. Just coffee. She didn’t have to be anyone but herself. Yet, as she drew nearer, the magic got stronger, almost overwhelming Zatanna's senses. It was all over her. Zatanna could smell it, almost taste it. It was strong magic indeed, completely intoxicating. "Well hello Zatanna," she said. "I'm Rebecca but my friends call ne Becky." "My friends call me Zee," Zatanna responded, far too quickly. "I didn't know if you'd come." "How could I not respond to a written invitation that was slipped into my purse while… I was handcuffing you." She laughed, slightly embarassed at her own words. "Now, that's a new one on me. Normally the coffee comes first, then the handcuffs." Zatanna grinned. "In Las Vegas you have to move fast. I saw you in the audience for three floor shows in a row. So I thought that you might enjoy getting me in the sack." "I didn't realise... that you had noticed me. I never suspected. Not until the spotlight shone on me and you asked me to come on stage. I was shaking. That was an incredible escape trick, by the way. How on Earth did you get out of the handcuffs, not to mention the locks and the bag? Was that real magic?" "Magicians never tell. But I've been doing that trick, or a variant of it, since I was seven years old. Daddy used to have a doll and during the act I'd trade places with it. Then he'd say, 'Come along Zatanna,' or words to that effect, and I'd get up. First night we did it, someone in the audience screamed like a banshee..."
Zatanna realised that she was rambling. Talking about her father and old magic tracks was something she often found herself doing. Realising this, she abruptly changed tack. "But enough about me she said. "Tell me something about yourself. What brings you to Las Vegas?" "I'm an insurance investigator. I specialise in the retrieval of... special objects. Like this." She handed Zatanna a photograph of a brilliant, cut gemstone. "It's called the Red Ruby. It was stolen in New York. Turned up in Atlantic City. Before we could get it, it was stolen again. Found the guy who stole it but he’d lost it too. Then I tracked it here to Las Vegas where it was rumored to be in the possession of this woman, Tina Whyte." 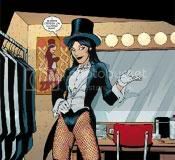 She placed another photograph in front of Zatanna. "It seems to get stolen a lot." "Indeed it does. I believe that it has a greed spell placed on it that causes anyone who comes too close to want to steal it. To counter that, I've prepared this." She removed the red ribbon from her hair and showed it to Zatanna. "It contains a magical binding that should restrain the magical powers of the Red Ruby." "Hmmm," said Zatanna. "Are you thinking what I'm thinking?" "That if I bound you with the ribbon, you wouldn't be able to use magic to escape?" "No," said Zatanna, barely avoiding laughing out loud but greatly intrigued at the thought. "I mean, that she's just over there and maybe you should get the Red Ruby off her before it gets stolen again." "Oh," she replied, spinning around. The woman in the photograph was there, with a large, burly man. They seemed to be involved in a heated discussion, which Zatanna and Rebecca quickly joined. "Like I was just saying to this guy," the woman said hastily, "I don't have it! If I had it I would give it to you. It's been nothing but a crook magnet since I got it." "So where is it then?" asked Zatanna, in her best deep, Batman-like voice. "I loaned it to someone." "To whom?" injected Rebecca. "For what?" "Some friends of mine. They wanted to summon a demon with it or something." "A demonic summoning!" Zatanna gasped. "How would they learn how to perform such a ritual?" "On the internet," she told them offhandedly. "Fabulous," observed Zatanna. "Next thing you know, they'll be making the Necromicon available online." "Ms Whyte, we have to find them!" Rebecca declared. "You have to tell us where they are!" "Ekat su ot eht der ybur!" cried Zatanna. Instantly, the three of them found themselves at what turned out to be a hall at the local high school. "Okay, well, that would be another option," observed Rebecca. Zatanna noted that someone had chosen the site and the participants carefully. They were dressed in dark robes, except for the leader, who was wearing an animal skin. By the look of it, it had been sacrificed by a semi on Interstate 10. They were just brimming withyouthful energy and reckless stupidity. Mundane daemons thrive on that sort of thing. Zatanna decided on the traditional dramatic superhero entrance, interrupting the proceedings for a quick introduction of Zatanna, mistress of magic in the cause of Justice. Ta da. "Zatanna?! Oh, well done Tina," the leader told the woman. "Why didn't you just bring the whole Justice League next time?" "What, is Superman coming?" someone asked. "I always wanted to meet Superman," said another. "Batman's really cool," added a third. "Shut up! All of you!" the leader snapped. "You don't know what you're dealing with," Zatanna told him. Daemonic summonings are dangerous. You may not be able to control it! You could get everyone here killed!" "Uh, Zatanna, would that include us by any chance?" Becky whispered. "Well, you can all forget it!" he announced, with an air of unjustified pride. "You superheroes always think that you arrive in the nick of time don't you? Well not this time. 'Cause we've already completed the ritual!" "Get them!" the leader cried. The daemon strode forward and said, in a deep voice that sounded like it came from the bottom of a cave: "Zatanna! Long time, no see!" "Beelphegor!" said Zatanna. "It truly has been a long time!" "You actually know this daemon?" asked Becky, wide eyed. "Are you on first name terms with all the sin daemons?" "Misspent youth," Zatanna sighed. "Becky, meet Beelphegor, sixth level lust daemon." "What?! Didn't you hear me?!" cried the leader. "Get them!" "Didn't you hear me?" Zatanna asked him. "I tried to tell you that summoned daemons have to be controlled. You have to be a powerful magic user. And the most powerful magic user here happens to be..." she placed her palm flat on her chest in a gesture of pride, "me." "So," said the daemon. "You get one wish. So what would you like done, Zatanna?" Then he added: "It has to be lust related, though." Zatanna looked intently at Rebecca, a mischievous gleam in her eye. "Zatanna!" Rebecca gasped. "You wouldn't!" "No," sighed Zatanna. Being the hero is tough sometimes. "Beelphegor, no one is to be harmed but I want that Red Ruby." "Well, you'll never get it," announced the leader with a smug look, "because I swallowed it." Beelphegor wriggled his fingers and tugged at the skin on his forearm, making a rubber-like snapping sound. "No problem," he pronounced in his characteristically deep voice. Within minutes, the Red Ruby was in Zatanna’s hands. "Yechh," was all she could say at first. "It’s okay Zee," said Rebecca. "We’ll clean it up with disinfectant, box it, wrap it and tie it with the ribbon containing the magical bind. With any luck, it should hold its magical powers in check." "Oh, I’ll make sure of that," said Zatanna. "I'm sorry I cost you a free wish from that lust daemon. I was thinking maybe I could make it up to you somehow." "Oh?" said Zatanna, arching an eyebrow. "Are you thinking what I’m thinking?" Magic happens. It happens everywhere and everyday. You just have to know where to look. Reference image taken from ZATANNA: PRACTICAL MAGIC.